Companies that employ delivery drivers and long-haul truckers should run the background checks listed below to make sure that their drivers are "model" citizens, have good driving records and are properly licensed. Companies can spending thousands of dollars in court costs and attorney fees if their drivers are involved in accidents and they were not properly licensed or had prior negative driving records. Why run an MVR Search? In some states, convictions for driving under the influence of alcohol or drugs cannot be found on the criminal court record and can only be revealed with a MVR examination. Companies with employees that operate a motor vehicle for business purposes can reduce risk and keep operating costs low by using Motor Vehicle Records when screening prospective employees. By identifying high risk drivers, Motor Vehicle Records can help your company improve safety and reduce liability and insurance expenses. In addition to pre–employment screening, industries can use these records for underwriting and rating of personal and commercial automobile insurance. -- Search Requirements are Name, State and Drivers License Number. -- PA, AK and PR require specific signed Release Forms. 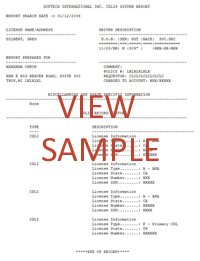 Need Help understanding the Codes on Your MVR Report? Just send us an email or fill out our Contact Request Form with your Request and Report ID and we will provide you with an explanation of the state codes within 2 business days FREE of CHARGE! Fleet Monitoring is a monthly online Driver Monitoring Service. The reports highlight invalid drivers, recent citation activity, and drivers that have current or upcoming license renewals. Management automatically receives the Fleet Monitoring Update Report every month in an easy to read format with a summary of monthly citation activity. They are streamlined to show only drivers with record activity that month. All other drivers are hidden from view. Batch Requests available. Please contact us for more information. Such ongoing features as monitoring and frequent email alerts will highlight invalid drivers' licenses, derogatory activities, suspensions and/or upcoming license expirations. Provides Real-Time access to Registration Information via the Internet. Searches may be requested by VIN or TAG numbers. These searches are ideal for Insurance companies. Search Fee: $6.95 to $15.95 (depending on state). Must be DPAA compliant. This product provides requesters with limited insurance information on vehicles actively driven on public roads. This is an excellent tool for Insurance Carriers, Rental Car Agencies, Attorneys and other organizations seeking to reduce the expense of State fees. Please Call. CDLIS allows employers and their agents to comply with FMCSA requirements (§ 391.21-391.27), by searching within the "Commercial Driver's License Information System" for any prior licenses, current CDL and up to three prior licenses held by said individual. Anyone who has had to screen for any sort of driving position knows that some drivers tend to have, let’s say, fuzzy memories. When people are not truthful to their insurance agent, it usually results in a rate increase or maybe a cancelled policy. With commercial drivers, the consequences of hidden violations – from a speeding ticket or accident up to an undisclosed CDL -- can be disastrous to an employer. Among other things, the Commercial Motor Vehicle Safety Act of 1986 made it illegal to hold more than one commercial license, and states are required to adopt testing and licensing standards. Search Fee $14.95. NOTICE: No refunds for driving records will be granted if the information you have submitted comes back as incorrect, invalid, in error or as “No Records Found." In addition No Refunds will be granted under any circumstance since these reports are instant. Drivers License Number is REQUIRED to order an MVR. Our System provides instant (48 of 50 states), online access to your driving records from your local Department of Motor Vehicles (DMV). The State DMV mandates what is reported on the driving records. NOTICE: This is NOT a certified copy of the driving record and is NOT for a Defensive Driving Course required by the courts.